I dedicate my last article in 1995 to the memory of Ismail The Magnificent whose reign lasted 16 years. The builder of modern Egypt died in exile at Emirgan near Istanbul in March 1895. He was subsequently buried in al-Rifai Mosque, Cairo. Three of Ismail's sons and two grandsons reigned after him. The last one, King Farouk (r.1936-52), lost his throne in July 1952. With him went the 147 year old dynasty. Ismail Pasha's progeny extends today over five continents and his last surviving grandchild Princess Fawzia, ex-Empress of Persia is a semi-recluse in Alexandria. Despite their legal ban, the non-hereditary titles of pasha and bey survive to this day for lack of a propos alternatives. Ironically, they are used mostly by officialdom and by the successors of that very same cadre--ministers, high ranking officers, undersecretaries--who sought to abolish all such 'feudal' designations. Whenever possible, supporters of the Free Officers movement tainted old honorific titles with vitriolic ridicule. Moreover, visual and printed media alike including children's storybooks were filled with venomous attacks against former title bearers. 'Comrade' and 'brother' were promoted for a while but never caught on. Centuries of class structures had firmly implanted the dignified Ottoman form of address--pasha, bey, hanem, effendi--into the everyday vernacular. They were so embedded in local culture and folklore they simply refused to go away despite the suppressive decree. Instead, they went temporarily underground so that for a while ex-notables and officials answered to "maitre", "al-ostaz" or "al-doctor" and much later, to "bash-mohandess." The farce lasted two decades. With most of the Free Officers now out of the picture or in guilded retirement, the '80s brought with it a resurgence of nostalgia. After thirty years it was again safe to evoke the past. A sign of these changing times are al-Ahram's obituaries which look more and more like advertisements or campaign posters, choking on pashas and beys, some genuine, others borrowed or assumed. With infitah money flaunted around, pedigree has become the last stand against the new rich raff and their ostentatious manners. "They have the money, we have the breeding" has become the catchall. Out came the old medals and decorations overdue for a good dusting and polishing. These were now unabashedly displayed on coffee tables and glass cabinets. Meanwhile, faded pictures of Circassian ancestors were placarded on walls next to dog-eared commissions of rank. "If you can't afford a swimming pool in Agami or a villa in Paradisio (Gouna), grandpa pasha's portrait or grandma khatoun's serma (old Turkish embroidery) does just as nicely provided these are displayed where all can see!" exclaimed a disgruntled member of the ancien regime. L'ancien regime is fighting back albeit, in tatty memento and souvenir form. Yet no one can deny that for over two centuries, pashas and beys were major players in the shaping of the area's history. In former days, achieving rank and title were prime motivations amongst the wealthy and the intelligentsia. Conferring, dispensing or heaven forbid, removing the elevated title of pasha (the closest equivalent to a British knighthood), was the exclusive prerogative of the Sultan (Padishah) in Istanbul. And since some of these titles were hawked by the state whenever it needed to replenish its coffers, distinctions did not come cheap. History will attest how one of the most expensive titles ever hawked by the Sublime Porte (Ottoman government) in Istanbul was that of Khedive. Here's the story. Webster's dictionary informs us that khedive is "a title used by the ruler of Egypt from 1867 until 1914 governing as a viceroy of the Sultan of Turkey." How this title came about and the heavy price tag is not mentioned. When Viceroy Mohammed Said Pasha died in 1863, in accordance to the Ottoman law of succession it was his eldest male next of kin who ascended Egypt's hereditary throne. Ismail Pasha would rule Egypt for the next 16 years. Dissatisfied with the title of 'pasha of Egypt' which put him on similar footing with other Ottoman governors towards whom he felt contempt and superiority, Ismail attempted to change the status quo. After all, Egypt was the empire's richest Pashalik and its governorship was hereditary. Why then, was it equated with the minor Vilayet of Bosnia and why was its hereditary ruler compared to the decree-appointed Pasha of Basra? Something had to be done. The opportunity presented itself during the first ever state visit to Egypt by a Turkish Sultan. This took place two months after Ismail's formal investiture in Istanbul. On 7 April 1863, the exalted Padishah accompanied by his son and three nephews arrived in Alexandria aboard the frigate Feizi-Djehad, itself a gift from Ismail during his recent trip to Turkey. Egypt's pasha had quickly recognized Sultan Abdelaziz's craving for expensive gifts and was determined to exploit this royal weakness to his utmost advantage. The Padishah's state visit was a festival in extravagance and expensive souvenirs. Fantasia followed gala and gala followed titanic parades. In return for his lavish hospitality Ismail received a diamond studded saber and was decorated with the Medjdieh first class, the highest Ottoman order. His sons--the eldest among them barely eleven--received the titles of pasha with the military rank of general. Ismail's mother, the Walda Pasha, received the Order of Osmanieh, an honor shared only by one other woman, the exalted Walda Sultan in Istanbul. As for Ismail's three wives, they received precious stones. Meanwhile, outside the palace walls, 500,000 piastres, a hefty amount in those days, were distributed among local charities of the different faiths. The sultan's gestures were adequately reciprocated. On its return trip the Feizi-Djehad's draft was two notches lower heavily laden with valuable gifts including exotic animals and birds, and 80 liveried servants compliments of Ismail Pasha. Members of the Sultanic retinue were not forgotten either. Each received a considerable financial gratuity. The stage had been set. Ismail had by now cultivated important friends from among the Sublime Porte's movers and shakers. Within months the Ottoman Government was sounded out about altering the order of succession to the benefit of Ismail's direct male heirs. The follow-up was a long and expensive process. It involved three years of diplomatic minuets, countless expensive 'gifts' and several visits to Istanbul by Ismail and the Walda Pasha. At last a firman of succession was issued on 27 May 1866. Henceforth, Ismail Pasha was allowed to increase his army from 16,000 soldiers to 30,000 and he could mint his own currency as long as he respected the mandatory mention of the sultan. Nevertheless, the firman fell short of what Ismail really wanted: Heredity for his progeny to the exclusion of all other relations. Another downside to this firman was that Egypt's annual tribute to the Sultanic coffers was increased from 400,000 sterling pounds to 750,000. Even so Ismail's persistent negotiations had partially paid off. He had won the first round despite violent resistance from rival kinsmen mainly his uncles Halim and Mustafa Fadel, both of whom were next in the line of succession under the old system. Acting together the uncles had wasted no time in bribing influential friends at the Sultan's court to stave off what they saw as a very alarming development: A development that, if left uncontrolled, could forever distance them from Egypt's throne. As Mohammed Ali's descendants frantically outbid each other in Istanbul, the Ottoman courtiers lined their pockets with hefty sweeteners and bakshishes. Small wonder affairs of this nature were purposefully rolled over ad-infinitum. The year 1867 caught Ismail in the middle of the Cretian imbroglio in which Egyptian and Turkish troops fought side by side to put down a Greek insurgency. This joint exercise coincided with protracted negotiations in Istanbul aiming at awarding Egypt a greater degree of autonomy. Also in the offing in Istanbul was the creation of a unique title for Ismail setting him above all the other Ottoman governor-generals. When the suggested designations of Aziz-Misr and al-Hakeem were vetoed by the Grand Vizir as titles too grand for the ambitious Pasha of Egypt, Ismail stepped up his diplomatic pressure in Istanbul using his troops in Crete for leverage. Representing him in the Ottoman capital were two accomplished Armenians. The first was Ismail's official envoy, Nubar Nubarian Pasha (afterwards Egypt's prime minister). He was responsible for the bilateral talks with the difficult Grand Vizir and some of the more accommodating palace chamberlains. The second representative in Egypt's pay was Nubar's relative, Abraham Kervok Karakehya Pasha. He was Ismail's ex-officio agent (Mr. Fix-it) at the Sublime Porte. His job consisted of bribing--blatantly at times--members of the Sultanic Council in an effort to swing votes in his master's favor. Karakehya Pasha had an unlimited budget at his disposal. The Armenians, with the help of Ismail's dwindling reserves, eventually won the day. On June 8, 1867, Ismail received the long overdue firman addressed to the "Khedive of Egypt". The title, which derives from the Persian khiva meaning the Divine, was acceptable to Ismail as long as it was unique in the nomenclature of ranks and provided he also kept his old title of pasha. Egypt had finally been upgraded from a Vilayet to a Khediviate! Not only that but Ismail had also embraced for himself a Khedivial anthem dubbed "Salaam Effendina" attributed to an inconsequential instrumentalist Guiseppe Pugioli and integrated into the Khedivial military band's repertoire by Maestro Lambert Juppa Bey. Later on salaam effendina would become Egypt's official national anthem under the monarchy of King Fouad (Ismail's son) after having been in turn the (i) Khedivial and (ii) Sultanic hymns. It continued as a national anthem during the early years of the republic. The much sought title survived 47 years, having passed on to Ismail's eldest son Tewfik (r.1879-92) and later to his grandson Abbas. Out of the three khedives who ruled Egypt two ended up in exile: Ismail, was banished to villa "La Favorita" situated on the golden mile running from Resina to Torre de Greco at the foot of Mount Vesuvius, Italy, and Abbas Hilmi who was deposed in December 1914 while on holiday in Turkey. Between 1867 and 1914 Egypt was swamped with khedivial this and khedivial that. The Opera was the Theatre Khedivial; there was the Khedivial Sporting Club (later Gezira), the Khedivial Bourse, the Khedivial Museum, the Khedivial Buildings (on Emad al-Din Street) etc. It would take a world war for both name and title to disappear into the annals of history. Meanwhile, as long as folklore and tradition still exist in Egypt, it will take much more for pasha and bey to go the same route. Are you sure G. Pugioli is responsible for the Egyptian national Anthem that survived into the 1950s? 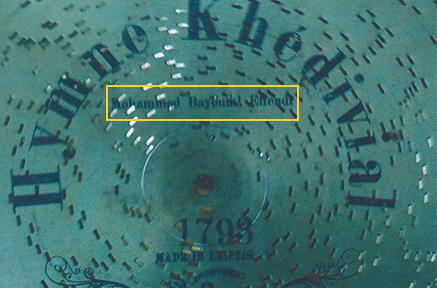 I believe it was a certain Mohammed Bayoumi Effendi who composed it, moreover I own an original metal disc of the anthem with his name engraved on it crediting him for the content. 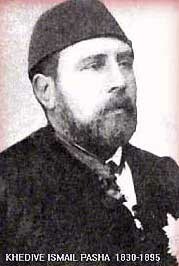 As evidenced by several publications, Bayoumi Effendi was "chef de bande de la Mahroussa se S.A. le Khedive" later to become head of the Khedivial military band with several (pour piano-forte) compositions credited to his name among them the "Marche pour l'avenement au trone" on the occasion of Abbas Hilmi II's ascencion to the khedivial throne of Egypt. Q. What is the title of Pasha? A. At first this was an honorific Ottoman title that accompanied the military rank of lewa--general or above. Eventually it made its way to the civil service whereby senior members of the government received it. Although there is no concomitant material privilege attached to the title it symbolizes status within the social structure. Besides being an honorary reward for services rendered it is also an addendum for exceptional accomplishments in one field or another. The title was conferred to males only whose prerogative it was to be addressed by the title. The title is not hereditary.